After a change of plans it fell upon me to organise the May club ride. I decided on a nice relaxed ride on some of my favorite twisty roads and lunch at Mirboo North. Little did I know how very very wet it was going to be. David P and I with our friend Jeanette on the back of the Passo left Marysville in constant rain as we headed to the pickup point in Lilydale. By the time we got to Healesville the rain had passed and the day looked promising despite the low black clouds looming above. A group of eight eager riders waited for us to set off from Lilydale. We headed along the Maroondah Highway and turned off onto the Warburton Highway toward Yarra Junction where we turned off again towards Powelltown. The further we went and started to climb the mountains the more the mist descended and light rain falling making visibility a challenge and the roads where slippery with debris and standing water. I took the group off the main Powelltown road and turned towards Nayook and to the Neerims, you know what I mean Neerim Junction, Neerim South, Neerim East. We passed under the Neerim Bower bird sculpture, which straddles over the main road before turning left to go to Nilma. By this stage the rain and mist had passed and the roads were slowly starting to dry out, a chance to pick up the pace on this lovely winding road. We quickly regrouped at Nilma before entering the highway and refuelling at Trafalgar. Bugger me, as soon as we got on the highway the heavens opened up, with cars and trucks travelling at 110 kph, the spray and rain made for an interesting ride. We all arrived at the United Service Station in Trafalgar just as the rain had stopped, a quick fuel top up and wee stop before lunch at the Mirboo North Hotel. The Grand Ridge road is one of my favorites as you climb the mountain range through to Thorpdale and with stunning country vistas however this time the pace was a lot slower as there was mud and standing water along the way. We finally made it to the Pub without any rain and looked forward to a hot meal and a chance to dry out in front of the fire. We where joined by Craig J from Arrawatta and Bruce from Traralgon who used to ride with Ross K 30 odd years ago before the formation of our club. We all had a lovely leisurely 90 min lunch before it was time to mount our bikes and head off back towards Melbourne. And guess what! No rain at this stage as we rode to Leongatha and then onto the highway to Korumburra. Here we turned off the main road again and started the climb through the ranges to Ranceby and the side road to Poowong and Nyora before a quick regroup in Lang Lang, and then joined the South Gippsland Highway to Tooradin. We waved good bye to H as we all turned right just passed the Tooradin airfield and H headed back home. A lovely ride through the back roads of Cardinia before joining the Princess freeway and to our final stop at the BP road house in Officer. This is where the ride concluded and it hadn’t rained for a good hour but the sky’s looking back towards Cockatoo and Marysville looked extremely ominous. 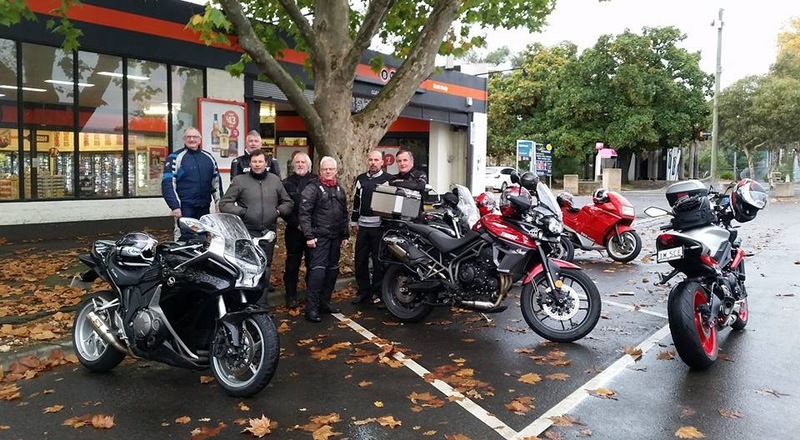 The main group of riders headed back toward Melbourne on the freeway as David P with Jeanette on the back of the Passo, Michael B and I turned of at Berwick and made our way to Harkaway and Beaconsfield before the heavens absolutely opened up. Torrential rain all the way as we splashed our way to Yellingbow where Michael B turned off and David and I continued to Healesville and back home to Marysville. The rain was unrelenting as we made our way through the Black Spur, with light fading quickly and a stream of cars heading towards us with their headlights glaring, visibility was close to zero, I don’t think we went any faster than 40Kph. We were so happy to finally get home as we stood at the front door of our house drenched and cold. I certainly hope the others got home safe and dry. Thank you to all that attended and braved the elements, certainly a ride to remember.